India's Maoist Naxalite rebels are running effecient espionage and arms procurement networks, that have the central government worried and perplexed. A large cache of government-issue explosives seized recently from Maoists by the Jharkhand police has unnerved the security establishment. The explosives were reportedly obtained by the rebels from the defence ministry’s ordnance factory in Wardha, Maharashtra. The revelation has exacerbated security agencies’ anxiety, which was initially brought by the discovery that the Maoists had ready access to the government’s secret anti-Naxal deliberations. DNA had reported on March 31 that government forces had recovered classified documents from a guerrilla unit after an encounter in Chhattisgarh. The documents contained minutes of two meetings held last year in which anti-Maoist operations were discussed. One of the meetings was chaired by Prime Minister Manmohan Singh. The recent seizure of explosives affords more insights into rebel operations. First, the Maoists’ supply of arms and explosives is not limited to those looted from police and security forces or procured from mines, or from crusher operators. Security agencies are worried that Maoists seem to have fixed conduits in sensitive government organisations and the defence establishment. Second, the haul reveals a link with Maharashtra, and a network so efficient that it facilitated untraced procurement and delivery to Jharkhand. The haul included gelatin sticks, fuse wire, and electronic detonators — in sufficient volumes to produce hundreds of landmines. The menace from the growing capability of Maoists is exemplified by a string of almost daily attacks in Jharkhand, Bihar, and Chhattisgarh. The most recent incursion was recorded last week. 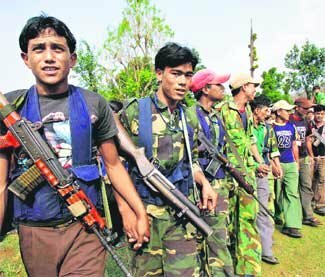 The large number of Maoist cadres involved in these incidents has worried security agencies. The numbers indicate the expansion of Naxal influence and support base as well as the failure of intelligence agencies to obtain information. Using children to be involved in the military. Hmm, now where on Earth do I find that to be quite similar? How about the Hitler Youth to which Hitler even encouraged Hitler Youth members to be involved in a paramilitary group against Allied forces? Doesn't that remind people of the Nazis whenever any group uses children as soldiers? The Tamil Tigers along with Palestinian terror groups such as Hamas and the PLO have also been using children in their own Hitler-style youth wings of their terror movement. I personally think these terrorist leaders should be held for war crimes for this.